As a child, I would look forward to Easter. Not because I was particularly religious, although I did get dragged to church by my parents, but in anticipation of three things: simnel cake, hot cross buns, and Easter eggs. My mother didn’t always make a simnel cake, but there were plenty of years that she did. In reality, it’s a lot like a Christmas cake only without the icing plus a lot more marzipan. I’m talking about a British-style Christmas cake. No offense, but I’ve yet to find an American Christmas cake that looks appetizing. Since the marzipan is the best part of Christmas cake, I really liked simnel cake. If I could get a slice with a marzipan ball on top, all the better. If I was allowed to cut my own slice, I usually could. Angling the knife to maximize marzipan and minimize cake helped, too. I think that sometimes we had the cake on Mothering Sunday, but on Easter Day other years. If you fancy making one, just click on the image and it will take you where you need to be. 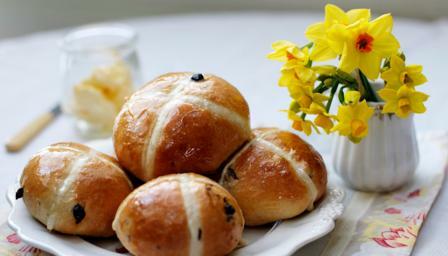 I think that I used to like the idea of hot cross buns more than actually eating them. There always seemed to be one mouthful with a gritty currant seed and it spoilt everything. I did like peeling off the cross and eating that first, prompting my father to tell me to ‘eat it normally.’ (But it WAS normal for me.) I had my first hot cross buns in years this year (far too early, but oh well ). Apart from a weird icing cross instead of the traditional pastry, they were fine. Again, the idea of them was more exciting than the actual eating. However, the best part of Easter was Easter eggs. I don’t know why I used to get so excited about Easter eggs. I didn’t get to join in the great post-Easter Easter Egg Bragging that went on in school because I never got one of the giant fancy ones. I didn’t receive them in bulk from every relative and friend of my parents, unlike lots of my class mates. I didn’t get the type that came in fancy mugs or with something special inside. A kinder surprise here or there doesn’t count because I always got the one with the most rubbish gift imaginable. Nevertheless, I would look forward to two thin chocolate shells wrapped in foil and a much bigger box which, by the time they were unwrapped, came to very little chocolate at all. I’d break it up into little pieces and make it last forever. However, there was one Easter egg that I would receive year after year. Unfortunately, it wasn’t even chocolate and I hated it. It was a Caramac egg. It was from my grandmother who no doubt lovingly bought them for all her grandchildren. (Or else she bought these only for my sister and me, and the others got the good stuff. I’ve no idea. ). But she gave it us one each, every year. Caramac is a kind of light brownish-orangey color, with a waxy, cheap chocolate-like texture, but with none of the flavor. It’s made of condensed milk, butter, sugar and artificial flavorings. Apparently there are plenty of people who do like it because the Nestle website has it listed, so it’s obviously still in production. I’m not sure what happened to the Caramac eggs every year, but I doubt my parents let them go to waste.